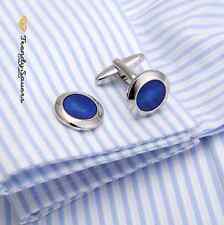 Blue Silver Cufflinks Crystal Circular Wedding Groomsman Pair Cuff Links sent in a velvet bag. At TrendySavers, this is pretty simple and straightforward. 11 Fyne Close. These unique, outstanding cuff links will make an amazing and personal addition to any shirt or suit. Made of solid 316L stainless steel with 12 little swarovski crystal around a square blue stone, classic,shiny and elegant. When talking about jewelry, most people think of rings, earrings, necklaces, or even watches. 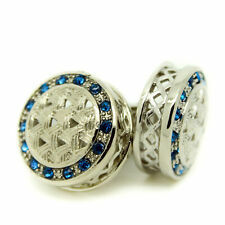 Stunning Silver Round Cufflinks With Bright Blue Stone. These also make an excellent gift. Money back. Most UK orders arrive between 24-72 hours. 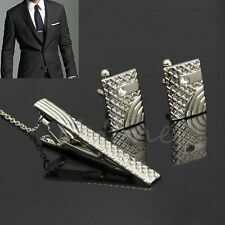 Impressively Crafted Tie clip & Cufflinks set. 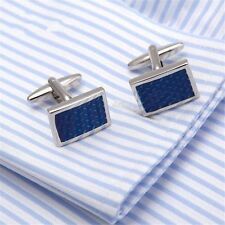 1x Pair of cufflinks. 1x Tie clip. 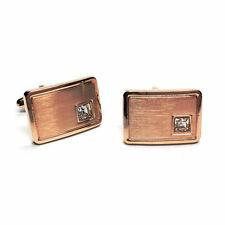 This sophisticated pair of stainless steel cuff links is synonymous with modernity and style. Sparkling intensely, the retangle crystal brings a subtle and refreshing hint of blue to your outfit. International Order. 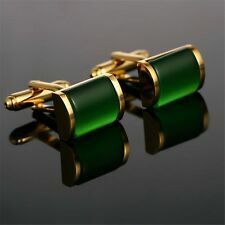 Impressively well Polished / Polished Cufflinks Pair. Pair of Swarovski Sapphire and Clear Crystal Ball Cufflinks by Onyx-Art, excellent quality and highly detailed. Swarovski Crystals. Perfect as a gift or even as a treat for yourself. Firstly so that we can improve our service, secondly because we will strive to resolve the problem for you. This unique design is sure to make you feel comfortable as well as stand from the crowd and add you style. If you need a durable yet elegant cufflink, this is for you! Material: Zinc Alloy. Note: Due to the difference between different monitors, the picture may not reflect the actual color of the item. 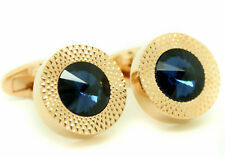 swarovski cufflinks In a Gorgeous Blue Topaz Colour Unwanted Gift Brand New. swarovski cufflinks In a Gorgeous Blue Topaz Colour Unwanted Gift Brand New.. Condition is New with tags. Dispatched with Royal Mail 1st Class. Applicable Gender: Male or professional femaleImportant Information Main Color: Silver. Hot Full Set. This might affect your order but we will advise you if your order is delayed in any way. Color: Black. Blue and Silver Crystal Circular Wedding Cufflinks sent in a velvet bag. Each set of Cufflinks and Studs go through an extensive electroplating process. Good Quality Material - A big round crystal with high quality stainless steel. 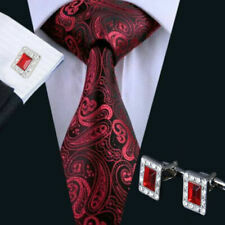 Set: Pair of Crystal Xilion Cufflinks and Tack Tie Pin. Handmade cufflinks and tack pin set. Silver (Gold on request) plated swivel type torpedo fixings and tack pin with a clutch. 11&8.5mm Xilion Crystal SWAROVSKI. THE GILDING IS FADED IN PARTS. SILVER GILT WITH ROCK CRYSTAL OBLONG FACETED STONES. RUSSIAN MARKS FOR STERLING SILVER - 875. Swarovski Crystal A Pair Of Dice Cuff links. Condition is Used. Dispatched with Royal Mail 1st Class. Also note that monitor settings may vary from computer to computer and may distort actual colors. Cuff Links x 1 pair. Due to the difference between different monitors, the picture may not reflect the actual color of the item. For wearing with a cuffed shirt, any occasion - the cufflinks are a great conversation starter. GOB SMACKINGLY IMPRESSIVE MULTI COLOURED SWAROVSKI CRYSTAL CUFFLINKS BY IAN FLAHERTY HAND MADE IN LONDON ENGLAND. 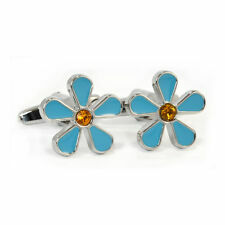 GENUINE DESIGNER IAN FLAHERTY CUFFLINKS NORMAL RRP IS £75. TOP QUALITY PRODUCTS.